Asus are offering decent performance, but is the price too high? Designed to offer a no-frills computing experience, the Asus K70IO is a surprisingly portable desktop replacement, which offers impressive performance alongside great usability. 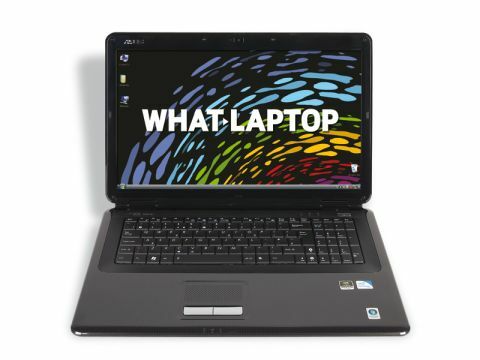 The 17.3-inch screen is large and highly detailed, boasting a 1600 x 900-pixel resolution. This makes it suitable for gaming and also for photo editing, which requires high levels of detail. The glossy Super-TFT screen is fairly distracting, however, as it often proves highly reflective. The chassis is simple but stylish and features Asus' IceCool design. This is a ventilation system that pushes hot air from the components out and away from the chassis, ensuring an always-cool palmrest. It works well and the laptop maintains a comfortable temperature. Build quality is excellent and the plastics used are tough enough for life on the road. Equally impressive is that, despite its shiny finish, the chassis doesn't pick up fingerprints or dirt easily. The keyboard is comfortable to use and the keys travel just the right distance with a smooth typing action. They are positioned very close together, however, and are flat, which makes it hard to distinguish between the letters. A dedicated numeric keypad has been included, but it is small and cramped. Although the mottled touchpad is comfortable to use, it is easy to brush while typing, sending the cursor across the page and altering the point onscreen at which you're writing, which is irritating. We found performance to be good across the board and the Intel Core 2 Duo processor and 4096MB of memory make multi-tasking various office and multimedia applications a pleasure. Despite costing more than the Acer Aspire 5739G-654G32Mn, this laptop features a less powerful graphics card, yet performance was only slightly less impressive. As a result, you'll be playing most games without issues, as well as editing photos and videos. At only 147 minutes, the battery life also failed to match the Acer. Connectivity is up there with the best, with 802.11a/g/n Wi-Fi providing a fast connection to wireless hotspots. Gigabit Ethernet is the latest and fastest wired networking technology, providing you with quick access to networks when at your desk. Four USB ports give you flexibility when connecting peripherals and both VGA and HDMI ports are present. The Asus K70IO is a fantastic all-round option. Its performance and usability are commendable.